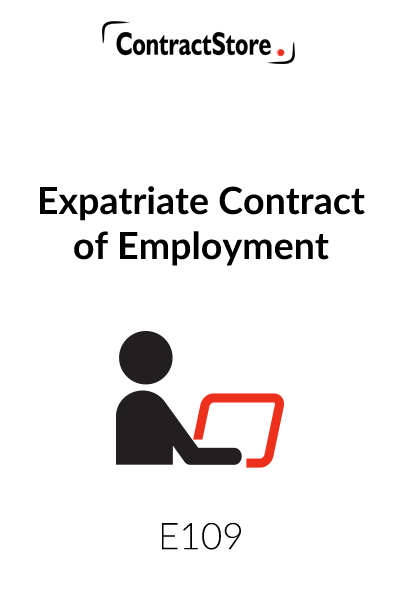 This expatriate form of contract is suitable for a company in one country that employs foreign nationals to work for it. A detailed Schedule is included, containing a menu of benefits with a number of alternatives (e.g. provision of furnished accommodation or a housing grant) and such matters as settling-in grant, bonus, travel allowances etc. From the information available the company can prepare its own particular schedule. You need this document if you are a company looking to employ a foreign national. This Employment Contract is designed for use by a company employing a national of another country to come and work for it. 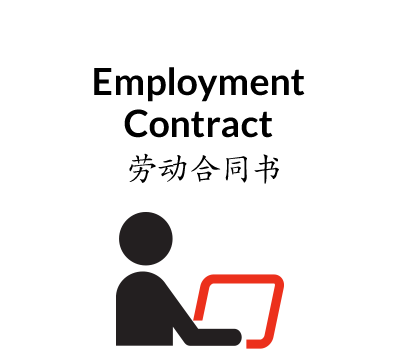 As will be seen, the contract is in a form where the terms and conditions are contained in the body of the contract, with the schedule which sets out numerous details concerning salary, start date, benefits etc. Clearly, the schedule may need to be quite substantially adapted depending on the extent of the benefits the Employer will provide. This is wide ranging and requires the Employee to work in the territory or elsewhere if so required and stipulating that he must devote the whole of his time to the business of the company. 2.4 contains a restriction on him from engaging in other activities and 2.5 makes it clear that he must comply with the laws and customs in the territory. The initial contract period is specified in the Schedule but this clause makes it clear when the contract starts and in 3.2 specifies that the first 3 months will be a probationary period. Details of travel entitlement are contained in the Schedule but this clause specifies that the Company will provide the Employee (and his family accompanying him) with free passage to and from the territory at the beginning and end of his employment. Here again, details are in the Schedule but this clause makes it clear that salary will be payable monthly. Details in each case are left to be included in the Schedule. This gives either party the right to terminate on 3 months notice at any time. This gives the Company the right to terminate the agreement at any time if the Employee is unsuitable or is guilty of misconduct. An Employee who provides false information in order to get the job may have to refund air fares and other expenses which the Company has paid (10.1.1). 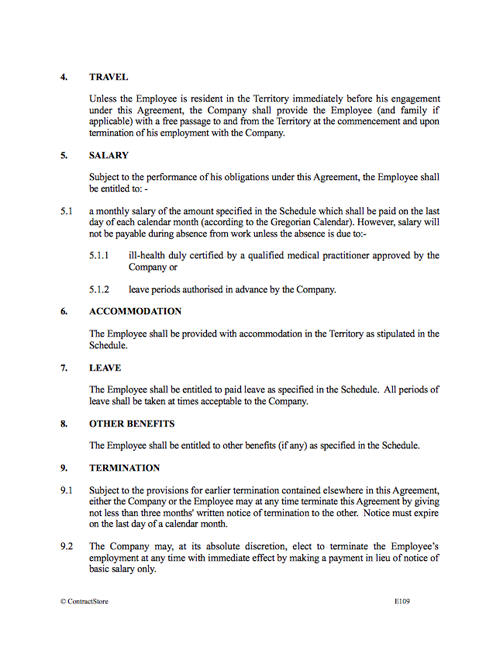 In 10.1.3 the Company can terminate the contract on 1 months notice if the Employee suffers from ill health. This makes is clear that the Employee may have to work outside normal hours. As with most employment contracts, it is sensible to include a provision requiring the Employee to keep confidential any information which he gains in his employment. This merely states that the Employee will be responsible for all personal tax in the territory. Depending on the tax regime, those taxes may be deducted from his salary by the Employer. 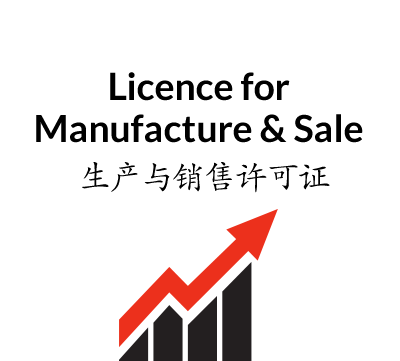 Where the Company’s head office is in the territory, the law of that country will apply. Otherwise, the Company may prefer the law of the country where its head office is situated. This makes is clear that the appointment is subject to the Employee undertaking a medical examination and is dependent on all the necessary formalities to enable him to work in the country as well as satisfactory references being obtained. This is a standard “boilerplate” clause which makes it clear that only the terms of this agreement apply to the appointment and not any exchange of letters or verbal agreements or understandings made before the formal contract. As will be seen, this contains a wide range of details to be inserted and these will, of course, vary depending on the Employer’s requirements and the benefits to be provided. In other words, the Schedule should be treated as a “menu” from which the benefits appropriate to that particular Employer and Employee can be selected.